Ever wonder what it would be like to spend two whole days immersed in Riesling? After attending Riesling Rendezvous in July, we’re happy to report that it’s a delicious experience! 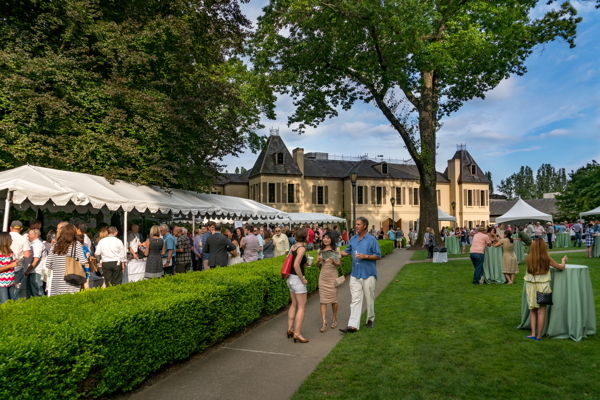 Riesling Rendezvous is the largest event dedicated to Riesling in the United States. 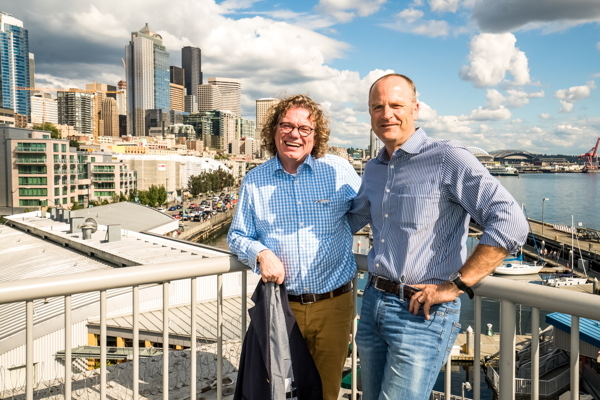 Every three years experts and producers from around the world gather in Seattle to explore the versatility of Riesling, discuss issues and opportunities to advance Riesling and forge alliances among producers and Riesling enthusiasts. Many of our IRF Friends sponsored, presented and attended the fifth Riesling Rendezvous in July. We hope you will enjoy these highlights and plan to “Rendezvous” with us at the next one in 2019! 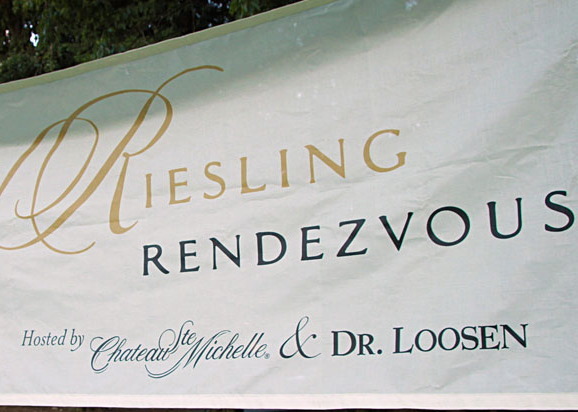 The Riesling Rendezvous 2016 Grand Tasting at Chateau Ste Michelle. Photo by Alabastro Photography. A good time and a lot of very good Riesling was had by all who were lucky enough to score tickets to the sold-out event. A sea of wine glasses awaits the Monday morning tasting of dry Rieslings. On Monday morning, it was time to get down to the serious conference with a panelist-led tasting of 20 dry Rieslings from producers around the world. As panel moderator Ray Isle (Executive Wine Editor at Food & Wine Magazine) said: “These [dry Rieslings] would blow peoples’ minds!” They certainly wowed the crowd. 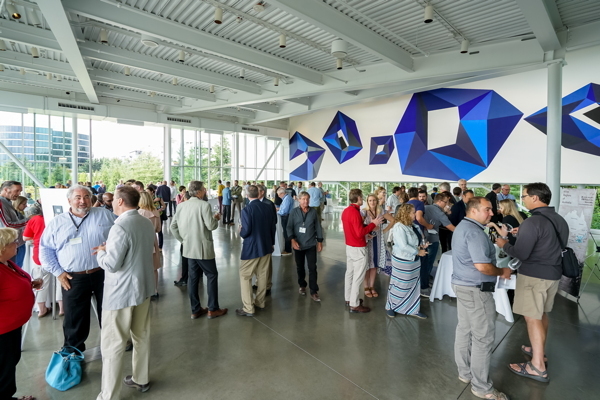 Riesling Rendezvous 2016 Sponsor Showcase at the Olympic Sculpture Garden in Seattle. Photo by Alabastro Photography. After lunch and more panel presentations, we all trooped over to Seattle’s Olympic Sculpture Park Pavilion for a special showcase by the sponsors. 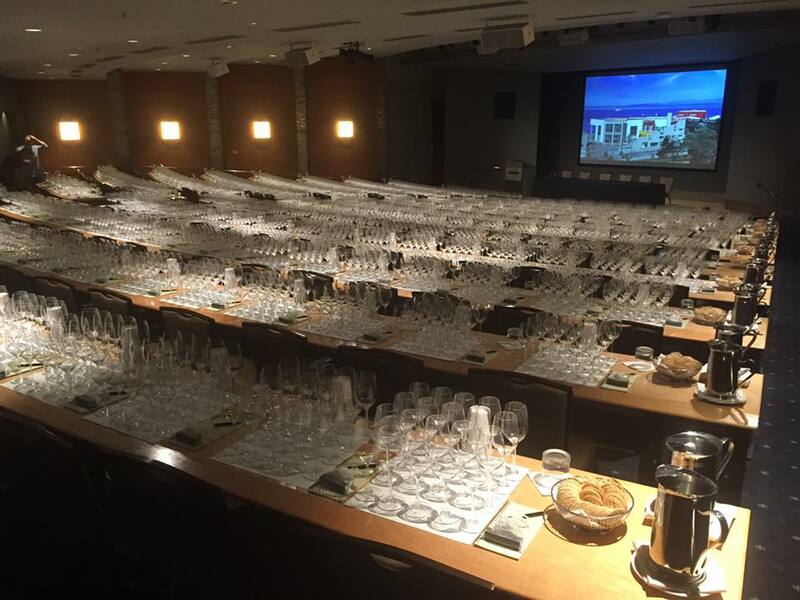 On Tuesday morning, it was back to the plenary room for another tasting. This time the 20 wines came from the middle-to-right side of the Riesling taste profile: medium sweet to sweet. Riesling guru Stuart Pigott declared one Riesling “a ‘Blade Runner’ wine: dazzling and a bit dangerous.” Words we would like to see people use to describe Riesling on restaurant and bar menus! After the tasting, lunch was sponsored by Oregon Riesling producers and featured wines by IRF Friends Brooks Wines, Brandborg Wines and Elk Cove Vineyards. This breakout session, an exploration of five distinct soil profiles from the 13 terroirs of Alsace, was sponsored by IRF Friend Alsace Wines/CIVA. Attendees were pleased to learn about this region’s great diversity of terroirs and landscapes and how they are expressed in Alsace wines. 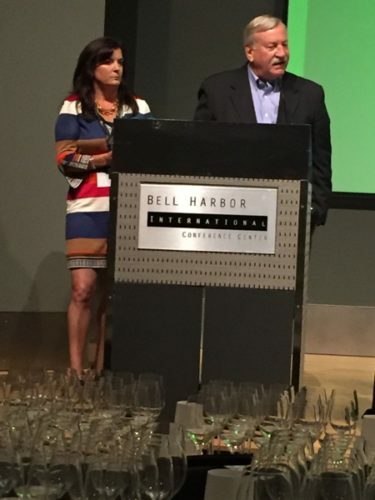 IRF Marketing VP Janie Brooks Heuck of Brooks Wines and IRF President Jim Trezise unveil a new video to help educate trade and consumers about Riesling. At this all-attendee presentation, IRF President Jim Trezise and IRF Marketing Vice President Janie Brooks Heuck (Brooks Wines) introduced our new social media campaign and shiny new website. They also unveiled a new video, “Your New Favorite Wine” and encouraged everyone to use it to educate trade and consumers about the wonders of Riesling. Riesling Rendezvous was a wonderful gathering and one more step forward for Riesling. We hope to see you at the next one. Riesling Rendezvous co-hosts and IRF Friends Ernst Loosen of Dr. Loosen and Bob Bertheau of Chateau Ste. Michelle at the Riesling Rendezvous Farewell Reception. Photo by Alabastro Photography.